With WLM "no update" patch, Windows Live Messenger will stop forcing you to update to v2009. If you're unsatisfied with Windows Live Messenger 2009, either because you keep getting errors, because it's a resource hog or simply because you don't like it, you might want to roll back to v8. But v8 won't let you sign in unless you upgrade to v2009, which you were trying to get rid of in the first place. With this patch, Messenger will stop forcing you to update. It works only with v8.5.1302.1018 (the last pre-2009 version) and v8.1.0178.00. The patch is simple and safe, it only changes the version information, making Messenger pretend it's v2009 so MS leaves you alone. 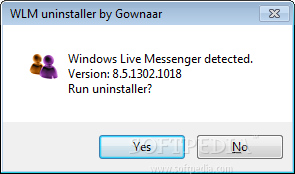 You can remove Messenger with the included WLM uninstaller. It supports all versions but it's only really needed for v2009 (earlier versions can be normally removed through Control Panel).